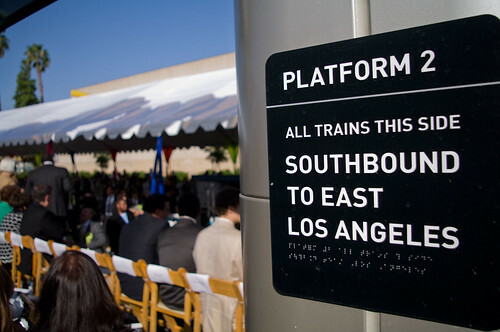 Federal, state, and local officials cut the ribbon on Union Station. 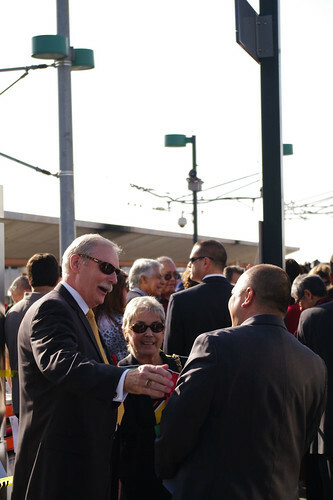 Former Metro CEO Roger Snoble attends the ceremony. 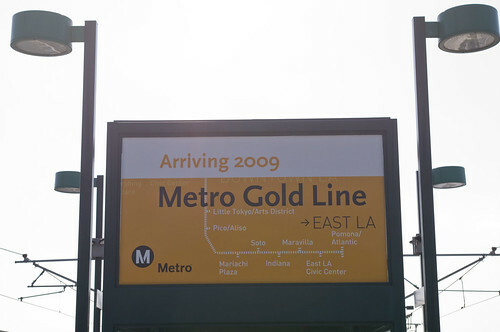 Metro employees polish the Gold Line train cars before they depart with dignitaries to East L.A. Civic Center. 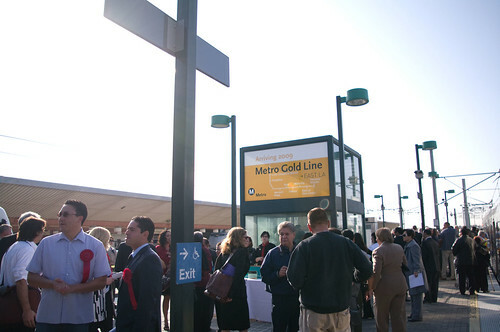 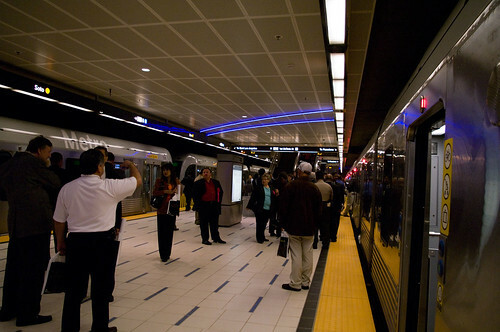 Officials and dignitaries crowded the Union Station Gold Line platform this morning. 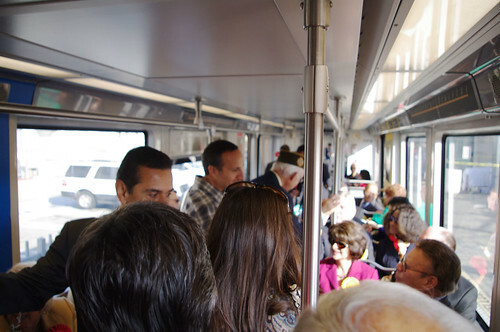 Officials and dignitaries crowded onto the Gold Line trains. 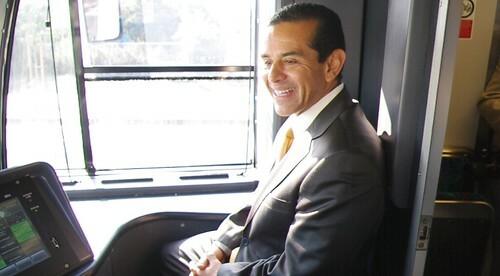 Mayor Antonio Villaraigosa rides in the cab of the Gold Line train as it makes its way to East L.A. Civic Center. 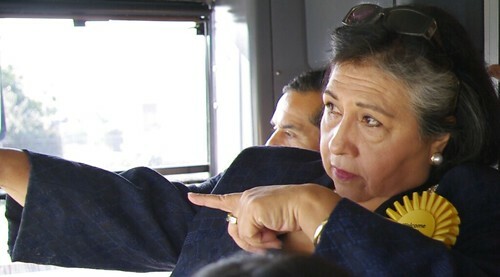 From the cab, L.A. County Supervisor Gloria Molina points out her safety issues with the line to Mayor Villaraigosa. 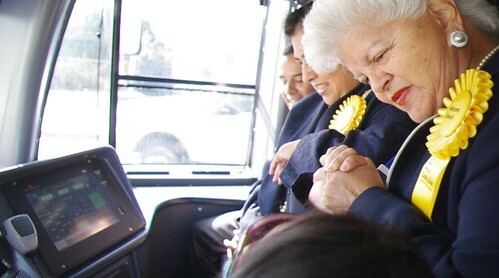 Representative Grace Napalitano shakes the hand of the train operator. 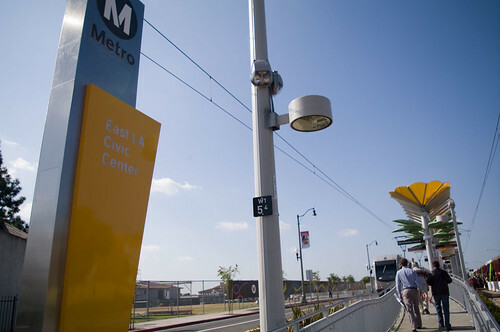 The Gold Line approaches a commerative banner at the East L.A. Civic Center station. 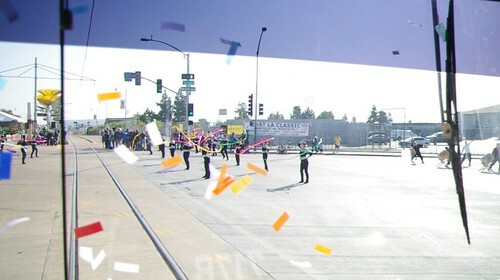 Confetti and ribbon twirlers welcome the Gold Line to the East L.A. Civic Center station. 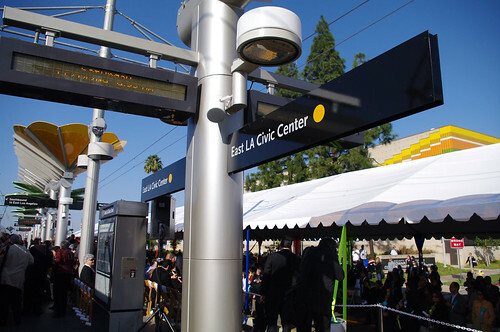 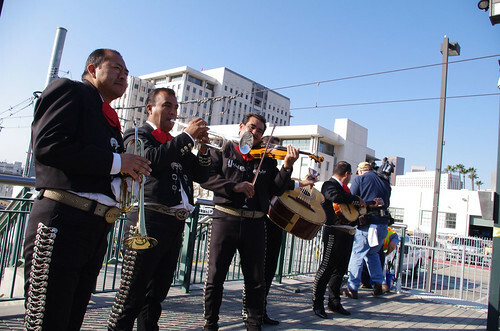 The official opening ceremony at the East L.A. Civic Center station. 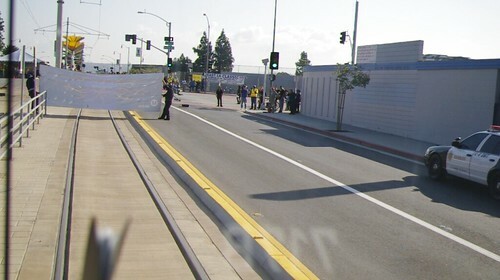 Seats were set up on the platform for VIPs. 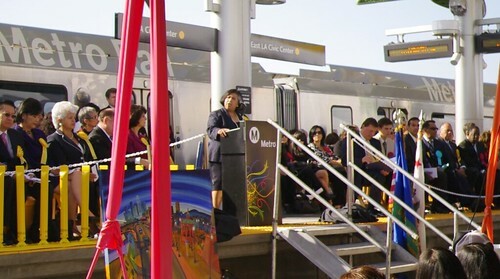 L.A. County Supervisor Gloria Molina delivers a speech commemorating all the years of work to make the new line a reality. 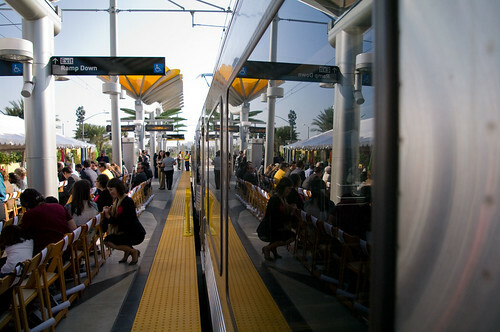 A Gold Line train made a spectacular backdrop to the ceremony. 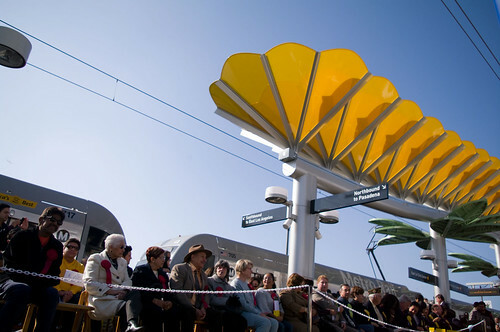 Members of the Review Advisory Comittee (RAC) sat front and center under the canopies of the East L.A. Civic Center station. 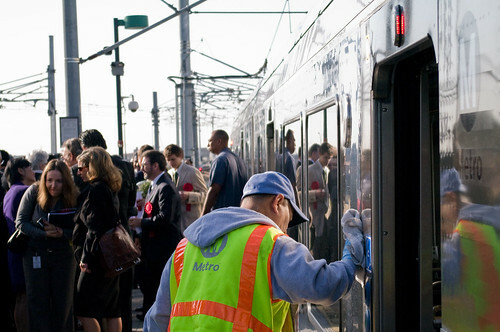 After the speeches and dedications, officials and dignitaries boarded the Union Station bound train. 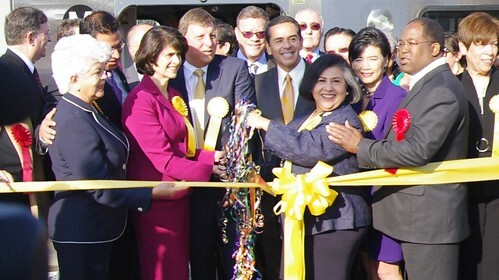 On the way back, the train made a brief stop at the Soto station for officials to partake in another photo op. 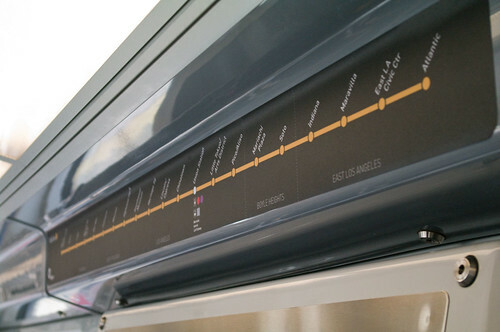 Gold Line trains are now outfitted with the complete map, highlighting the 21 stops from Pasadena to East L.A.
As so many at the ceremony said, a promise has been delivered, the Gold Line has come to East L.A.